Natchez Great Sun Hutke Fields introduces children to their heritage. The Mississippi Department of Archives and History (MDAH) is hosting a series of events to celebrate Native American culture and history in Jackson, Greenville, and Natchez beginning October 23 and running through November 17. Highlights include special screenings of the new four-part PBS documentary Native America at the Museum of Mississippi History in Jackson on Tuesday, October 23, at 6 p.m. and at the Grand Village of the Natchez Indians in Natchez on Thursday, November 8, at 6 p.m.
“We are excited to partner with Mississippi Public Broadcasting, and we hope that the new PBS documentary Native America will inspire Mississippians to learn more about the history of the First Peoples in our state and to visit the many sites around the state that celebrate and honor this rich and important history,” said Katie Blount, MDAH director. 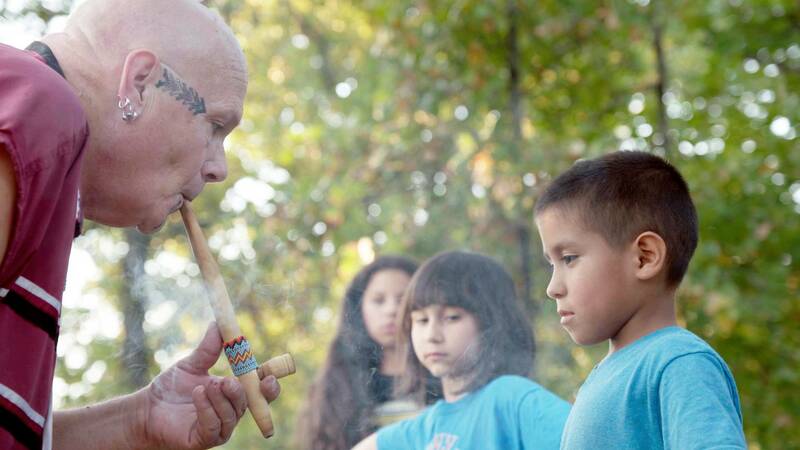 Native America will air on MPB Television, Tuesdays, October 23–November 13, at 8 p.m. The documentary series combines modern science and scholarship with Native American traditions and oral history to bring to life the world created by America’s First Peoples. The third episode draws on Mississippi’s significant Native American history as it examines the mound civilization Cahokia and the connections of Native descendants including the Choctaw and the Natchez. On October 23 at 6 p.m., the Museum of Mississippi History will screen a thirty-minute excerpt of the PBS documentary Native America in the Craig H. Neilsen Auditorium followed by a discussion with Robbie Ethridge, University of Mississippi anthropology professor, and Jay Wesley, member of the Mississippi Band of Choctaw Indians and director of the Department of Chahta Immi. From October 24 to 26 Winterville Mounds, located six miles north of Greenville, will host Native American Days. More than 3,000 students annually attend and learn about Native American life through interactive demonstrations including crafts, pottery, basket-making, and dancing. Registration is required. On October 25 at 6 p.m., the Winterville Mounds will host Night at the Mounds. The Quapaw dance troupe Best Feathers Dancers will demonstrate traditional Native American dancing, music, and storytelling around the Great Fire. On November 7 and 8, the Grand Village of the Natchez Indians will host its annual Student Days, a hands-on experience designed to help students and teachers learn more about Native American cultures and French colonists in the Natchez area. Registration is required. On November 8 at 6 p.m., the Grand Village of the Natchez Indians will screen a thirty-minute excerpt of the PBS documentary Native America. Guest speaker Natchez Great Sun Hutke Fields, who appears in the fourth episode of the documentary, will discuss his role in the film and contemporary Natchez society. On November 17 from 11 a.m. to 4 p.m., the Museum of Mississippi History will celebrate Native American Heritage Month by featuring Choctaw Expressions, a presentation of traditional Choctaw arts. Enjoy hands-on demonstrations of beadwork, dance, music, stickball, and basket weaving. The museum will also show the thirty-minute excerpt of the PBS documentary Native America. Admission to the Two Mississippi Museums will be free as part of the monthly Free Third Saturday initiative. In Natchez on November 17, Choctaw basket makers will demonstrate at the Grand Village of the Natchez Indians’ open house and museum store holiday sale, where all baskets will receive a fifteen percent discount and all other items will receive a ten percent discount. The museum will also show a thirty-minute excerpt of the PBS documentary Native America. All events are free and open to the public. For more information call MDAH at 601-576-6850 or visit mdah.ms.gov.